Gold Coast tree lopping and tree removal specialists, Gold Coast Stump Busters have been servicing Beenleigh to Tweed Heads for the past 15 years. No job is too big or small for this professional team. Fully insured and qualified with state of the art equipment we are your one-stop shop for tree removal on the Gold Coast. Jake Heyman is the owner-operator of Gold Coast Stump Busters. He was born and has grown up on the Gold Coast his whole life. Jake started by working for the company 15 years ago. Over five years he learnt everything there was to know about running the well-established tree removal and stump grinding business, and when the opportunity came up to purchase the company ten years ago, he jumped at it. Over that time the business has gone from strength to strength. Jake has become a qualified Arborist and recently purchased all new equipment including a brand new 18-inch Bandit Chipper and 20 cubic meter Hino Truck. Due to working and living on the Gold Coast for so long he has built up a vast local knowledge and raft of experience in everything to do with the tree industry including tree trimming and maintenance, total tree removal, land and block clearing, storm damaged and dangerous trees and stump and root removal. 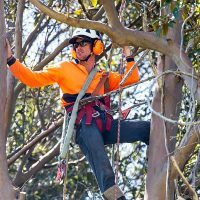 He specialises in difficult access tree removals and is often referred by other tree loppers and arborists who are not able to perform the bigger jobs. Gold Coast Stump Busters is a family run local business which enables us to keep our prices reasonable with also offering an exemplary service that ensures we have a substantial stream of repeat customers. Jake always goes above and beyond to ensure all his customers are satisfied with the result. Damien has been climbing trees since he was a kid and has always known he wanted to be an Arborist. Initially, from Yamba, he worked down there for several years for a small tree lopping company where he first started to learn to climb. 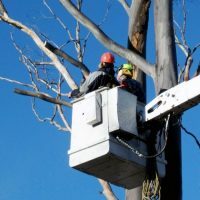 He then began working for a large powerline clearing company in Victoria and obtained his Arborist Certification as well as other assorted certificates. Damien then made his way up to the Gold Coast to be closer to family and started working for one of the larger Tree removal companies. Unfortunately, they lost a big government contract we were lucky enough to employ him. With nine years experience climbing trees and even more on the ground he is an asset to our team. Gold Coast tree lopping and tree removal specialists, Gold Coast Stump Busters have been servicing Beenleigh to Tweed Heads for the past 15 years. No job is too big or small for this professional team. Fully insured and qualified with state of the art equipment we are your one-stop shop for tree removal on the Gold Coast. Call Us today for free obligation quote. Trimming can be done at any time of the year and regular maintenance actually reduces tree pruning cost. We offer help to property landowners and developers with their tree clearing. We make emergency tree removal on your property easy.